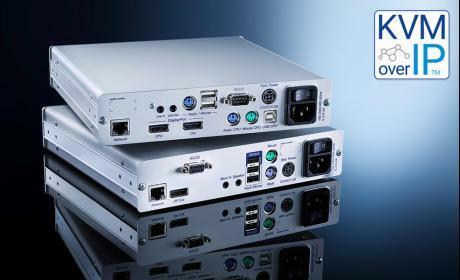 The system works as a KVM Extender over IP or as a CPU interface Module & User Interface Module when used in conjunction with the ControlCenter-IP to form a KVM Matrix system over IP with up to 500 end points. DP-Vision-IP-System consists of a computer module (transmitter) and a user module (receiver). DisplayPort image data is processed according to DP1.1a. Thus, the maximum possible image resolution of a pixel rate will be between 25MPixel/s up to 600MPixel/s. The DP-Vision-IP-System consists of a computer module (transmitter) and a user module (receiver). DisplayPort image data is processed according to DP1.1a. Thus, the maximum possible image resolution of a pixel rate will be between 25MPixel/s up to 600MPixel/s. The transmission is compressed, pixel perfect, with low latency and ideal hand-eye coordination on LAN infrastructures over standard IP networks on layer 3 even beyond optional network components. With the Monitoring function, you can auto-output device status messages to Syslog servers or via SNMP. The web interface lets you monitor the device manually.